What does it mean when a cat is declawed? How is it done? Examine these drawings. The cat's claw is not a toenail at the end of the toe as in other animals. It is movable digit attached to muscle as a finger might be. Note the strong ligaments and tendons which give power to extend and retract the claws. This is unique in cats. Without this your cat would not be able to properly grasp, hold or establish footing for proper walking, running, springing, climbing or stretching. Think of the cat as having 10 toes on each foot. 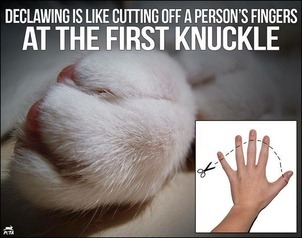 Declawing is akin to cutting off half their toes. When the end digit, including the claw is removed, the sensory and motor nerves are cut, damaged and destroyed. They do not repair themselves or grow back for many months. Following the surgery there is a wooden lack of feeling, then a tingling sensation during the long convalescence while the cat must walk on the stub end of the second digit. Remember that during all this time the cat may not "rest" his feet as we would after a similar operation but must continue to scratch in his litter box, walk and attempt to jump as usual regardless of his pain. Since cats have keener senses than humans, they suffer even more than humans. Many pain killing drugs, including aspirin, do not agree with cats and can cause illness or even death. Anyone who has had surgery will appreciate the problem that can be created by the inability to take pain-relieving medication. It is also possible for the claws to grow back, but often not in the normal manner, instead they may grow through the top or bottom of the paw, creating a bloody, painful sore. An Atlanta news station recently had a story of a declawing followed by infection so severe that the cat's foot had to be amputated. The cat's body is especially well designed. The skeleton is better jointed and more elastic than most other animals and the muscles governing the lithe body are highly developed. This gives the cat great climbing power. The sharp claws can be whipped out for business or tucked neatly away. The elastic tendon holds the claw in its own sheath. The claw is flat on each side so it will slide in and out better. When the cat pulls his claw down with the use of the big tendon that lies along the under part of the toe, the ligament stretches like a fresh rubber band. It is hooked on the end for hanging on. Cats like to keep their claws sharp and clean (and remove the outer sheath of the nail) by working on the scratching post you provide. Equipping your cat with the proper scratching post and taking the time to train him to use it will help preserve your furniture and carpets. Scratching posts made of soft carpeting teach your cat that soft fabrics, i.e. your sofa and rugs, are proper for scratching. A better idea are posts made of sisal rope or carpet turned inside out. This encourages your cat to scratch on hard, coarse surfaces. Training your cat to use this post takes some effort on your part. If you see him attempting to scratch on furniture or carpet, clap your hands sharply, say no! then pick him up gently and place him on the sisal post. (If stronger measures are needed, you might also want to keep a squirt bottle with plain water handy.) If your cat seems to prefer a particular area, try covering it with aluminum foil for a while. Catnip-treated cardboard scratchers, best used lying flat, are also effective. Most cats are pretty smart and after a short time, and much praise, will get the idea. It is also essential to properly clip your cat's claws with a well-made cat claw scissors. The sharp hook must be clipped off without injuring the pink quick. Cutting into the quick will hurt the cat and you will have a difficult time holding him quiet the next time. Besides the physical mutilation, consider what declawing may do to the cat's emotions, the personality changes that may occur. Knowing he has not the means to defend himself, some cats follow the precept of the best defense is a good offense, and will bite at the least provocation (and it may truly be the least provocation.) Others become depressed and lose the loving personality that made you choose him to start with. "The Learning Channel" had a series of documentaries about cats in January of 1993 and again in July 1995 and several of their comments were appropriate to this flyer. In one segment a cat owner spoke to a pet psychologist about her biting cat. It was no surprise to me when she admitted that the cat was declawed. Another segment showed a kitten being declawed. The commentator said that declawing was an American procedure and, in fact, most veterinarians in other countries refuse to do the operation. Failure to trim claws in this situation will result in additional veterinary attention throughout the cat's life as the claws will grow around and into the paw pad of the foot. You can imagine how much daily pain a cat would have to go through in this condition. If you really love your cat, you will want him to lead a long, happy life, giving and receiving love and affection. If you really love him, and care about him, don't declaw him. We wish to thank and give credit to the All State Burmese Society, a CFA club, from whom the bulk of this information was gathered.